Now get ready to shine through your customer’s inbox and get your emails actually opened, read and clicked! 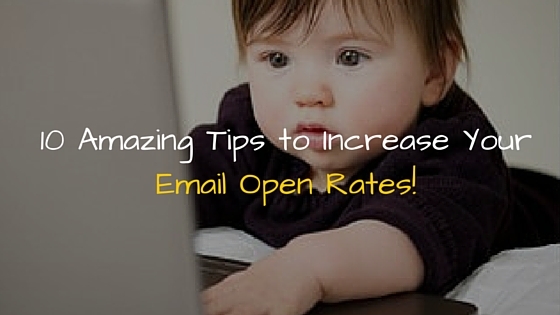 Here are 10 tips to help jazz up your email subject lines. Keep your subject lines short and sweet. It should be of maximum 50 characters. Yes, I understand It’s quite difficult to express your whole email in so few words, but it’s effective. If you don’t want to add personalization by using tokens like using names in the subject line, you can go for “you” or “your,” as it still sounds like you’re addressing them. If your customer has downloaded any of your offer and you’re delivering it through email, it will be very great if you use a subject line something like, “your new guide is waiting!” or “your ebook awaits!” This will work better than a simple “thank you” in the subject line; it creates an excitement that something is waiting inside the email, specially for them. Think about when you call in a company and some machine starts talking to you. It’s really frustrating, right? After all, nobody likes talking to a robot. The same goes for your emails also. Never go for a “[email protected]” I am serious and repeating again, never use this email address. Not only it looks less personable, it even stops people from adding you to their address book. Remember it’s better to remain unread than getting unsubscribed. Never try to make false promises to get your email opened. This is really irking and will annoy your audience and probably throw you on the unsubscribe list. One of the best subject line style that will stop readers from passing by: Urgency. Using deadlines tokens like “ for today only” or “24 hours left” will make your reader to act fast, instead of letting the email off for later – where there’s a chance of them to forget about it. You must have observed that blog titles with numbers get more readers same as that using numbers in your subject line can be proved as an effective practice. People love lists and human curiosity always boosts up when numerals are engaged. So, if you want to increase your email open rates just start working out for your subject lines. Keep remember your subject line is the first impression of your email and your company as well. Discover your lucky subject line type and start following it.